Wall Street does not make capital allocation decisions. Business executive make these decisions. When Warren Buffet buys shares in Moody's, Moody's receives nothing. The loan market, the bond market, and the commercial and investment bank only decide the cost of capital. To what field should society allocate the (N+1)-th big brain to achieve the highest marginal return? This really is the question, isn't it. One which rarely gets asked in an honest manner. Ultimately, of course, the answer depends on one's values and the corresponding measure being used to assess "highest marginal return." I thought we had finally dispensed with this theory?! Or is the market now "efficiently" shedding all those Harvard grads? ... and price signals must be correct! Of course society sends other signals, as well (Nobels, Field's Medals, etc.). And there is the personal happiness and satisfaction (by most measures rarely correlated with income above a certain level), something you've written about recently. If you mean allocation by incentives, who are the wise people who will formulate the incentives? Consider, for example, Shleifer's record. Consider America's ruinously incompetent political class; just ten years ago, this was shaping up as another American Century,and now... (I suspect the incompetence is bipartisan, but that remains to be seen). I agree with the overall sentiment of your post, but I'm curious about what kind of policy mechanism you have in mind. The danger is that unintended consequences of such a mechanism will yield more harm than good. Does this question even make sense? The U.S. economy is not a planified one. Decisions on the allocation of labor are not centralized. The notion that high-paying jobs are jobs that contribute to society (the market is efficient yadda yadda yadda) is fallacious ad nauseum. Earning big bucks does not measure one's contribution to society, it only measures one's contribution to the employer's bottomline. Assuming that the interests of the employer are those of the society at large looks like a ludicrous leap of faith. This dogma stems from some people's desire to invent excuses for the pointlessness of their high-paying jobs. Finance is nothing but the lubricant of the economy. The bureaucracy of capitalism, if you will. A necessary evil. "Some professions are socially more useful than others, even if they are not as well compensated,"
and it's an efficient market then presumably bankers are being paid without taking into account negative externalities (or perhaps they're getting their market rate and scientists/engineers are not getting positive externality benefits). What do you think these externalities might be and how could a government legislate to fix this? The problem is surplus value and exploitation. The problem is capitalism. Who has the gold makes the rules, especially the rules of compensation. Steve - unless I am misreading the original research paper quoted here, its results are actually orthogonal to a theme of this blog - "is it perhaps suboptimal for society to allocate so many bright minds to finance?" While the WSJ portrays the research as arguing against techers marching off to finance, that isn't the actual result at all. What the original authors showed was that societies which put more people through engineering education grow faster than those that educate more people in business and law. 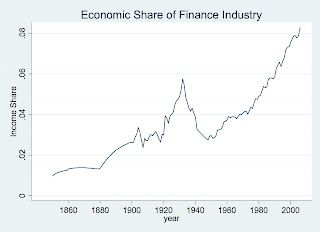 To build on the original work, one might argue that finance is improved by being invaded by techers. The social value is created by educating the bright minds in science and engineering. Once taught those disciplines, those minds are more productive than when filled with the, perhaps arbitrary, facts of law and business. Check out the original paper. LY: it's a theme that is explored on this blog, but I don't claim to have a definitive argument about whether we've passed the saturation point on techers in finance. It may have been that the increase in number of finance people with sci/tech backgrounds from 1980-present was all for the good and that we only overshot in the recent bubble years. I doubt anyone would argue that 1/3 of the MIT class and 1/2 the Harvard class should be heading into finance each year. But you know how I approach such questions -- I don't claim to know the answer with high confidence. On this blog I just gather the data and ask the pointed question. Regarding earlier comments: yes, I know people will differ on what is "good for society", and no, I am not proposing central control of human capital allocation :-) We do have incentive tools, though: funding for grad training, professors and research; tax incentives for long term venture capital investment vs short term arbitrage, etc. Yep, I understand you are asking the pointed questions - and this is very refreshing in a world full of "avoiders". My point here was that the WSJ got the results of the research wrong - it does not support (nor argue against) the finance bubble conclusion. While I wouldn't argue that 1/3 of the world's top grads should head into finance, I might argue that it's the right move for the U.S. As I've mentioned before, lower skilled workers in the U.S. live far better than the global standard (talk about collecting rent!). I suspect this may be crowding top U.S. grads into highly levered fields (such as finance) as the U.S. struggles to maintain its per capita GDP in a globalizing world. Unlike the manufacture of low-end automobile tires, the U.S. is ultra-competitive in finance. Someone has to pay for those incentives you mention for grad training and professors. The US is also very competitive in entertainment. Should more of its best minds go into that? Anon - yes, I agree the U.S. is extremely competitive in entertainment, and that the U.S. should focus more of its top-notch talent on entertainment than on producing automobile tires. "The problem with poor people is they make too much money. Open borders would mean the poor in rich countries would make something closer to what they're worth. In an ideal 'rent-free' world the rich countries of the world would be much more like South Africa and Latin America." What does this way of thinking ignore? As a democracy, the U.S. has to protect the standard of living for everyone (or at least for 51%). I fear we have to either (a) focus our talent on leverageable competitive industries, (b) fight off globalization, or (c) surrender up that standard of living. The idea being that if more Caltechers were busy building Martian landers, then maybe more than half of them would work when they hit the red planet. But instead the techers are being deployed to produce foreign exchange for the U.S. Martian landers are more fun than finance, but they don't help us balance our capital account with China - unless you wanna go with option (b). "As I've mentioned before, lower skilled workers in the U.S. live far better than the global standard (talk about collecting rent!)" The experience in South Africa after 1994 and BEE contradicts this. There are a lot more poor whites, but still only 15% of the white population lives in poverty. I think you underestimate the skill and know-how acquired on the job by people in rich countries without formal training. Legal immigrants to the US without any skills have a very limited choice of jobs. Are the Ukranian PhDs bringing down bonuses at IBs? Why aren't they? "Anon" - I have to agree that you ask the right questions!! In the globalization battle countries put up lots of barriers to the free movement of both capital and labor. Like most highly developed countries, the U.S. puts up high barriers to labor mobility and low barriers on capital. China, on the other hand, has high capital barriers and low labor barriers. You will find a large number of people raised in formerly Soviet republics working in finance in the West - largely on the quant end of things. IMHO they are indeed bringing down quant wages in the U.S. and U.K. They work very hard to defeat the labor mobility barriers erected by the West, and, once they make it through, supply an awful lot of income tax revenue to the Western governments. I will add that I think your statement about South Africa is very interesting as well. Why is it that whites in South Africa are still so much wealthier than blacks? My person opinion is that culture is a strong influence on the human outcome. This blog often explores a genetic question as well. I think your question is a good one, but I can't offer an answer. But I will point out this fact - whites are leaving South Africa, and I would speculate that in a decade or two it will be like Zimbabwe. The U.S. is an increasingly heterogenous country, home to an increasing diversity of races, religions and beliefs - this is part of a long trend which has correlated with great wealth creation. Not so South Africa. The South Africa of past decades was a horrid place showcasing some of mankind's worst weaknesses. But the Sourth Africa of the future does not look to be a place welcoming of diversity - be that for good reasons or ill.
A post-script. So, here we are 4 years later and where is Ted Fernandez? Thanks to LinkedIn we know he is a management consultant at Booz doing "large financial-related data analysis, including multi-billion dollar financial strategies for CFO organizations of Fortune 500 companies and large government agencies. He also specializes in producing financial decision making tools for its clients."